First Line: "So, what are you asking me?" Harley said. To the profound relief of Zack Walker's family, they have moved out of the suburbs and back to the city. Not only that, but Zack is now working as a features writer for the city newspaper. No longer will he be able to hatch his paranoid protection plots from the comfort of his own home. But is that really going to stop him from driving his wife and children nuts? Zack is researching his first feature article and finds himself riding along on stakeouts with a private detective. Someone is going around burglarizing high-end men's clothing stores. When Walker stumbles into a real-life hit-and-run crime scene, he finds himself heading straight for a confrontation with syndicate boss Barbie Bullock, a man known for his ruthlessness and his doll collection. You'd think that Zack would have more than enough on his plate with that feature assignment, but wait-- there's more! His college student daughter has a strange boy following her around. His son's not acting right either. What's more important to a paranoid father-- a ruthless mob boss who's after him, or his two kids acting strangely? You know as well as I do-- Zack tries to do it all because he's Super Dad! Zack Walker is the kind of guy who would undoubtedly drive me insane in real life. He spends way too much of his time "borrowing trouble." Fortunately I don't know anyone like him; therefore, I can laugh my way through his escapades in Linwood Barclay's wonderful books. 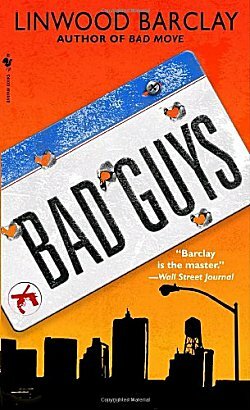 There is indeed plenty of laugh-out-loud humor in Bad Guys, as there was in the first book in the series, Bad Move. One of the things that makes us laugh the most when reading about Zack is that most of his problems are caused by his own paranoia. He does B to prevent A, which creates C. C collides with A, making all Hades break loose in D, with no one in Zack's family talking to him or even wanting to look at him. If he'd just left well enough alone... but no, he can't, and he should just save time and build himself a dog house out in the backyard, complete with heating, air conditioning, TV... the works. He'll be spending a lot of time there. He just can't help himself. If he weren't so good-hearted and well-intentioned, we wouldn't love him so much as we shake our heads and laugh. Another fun thing to do is to pay attention to the things or the people Zack is introduced to and try to figure out how they're going to blend into the story a few chapters down the road. Because they will. Barclay has a very subtle way of shining a little spotlight on something that lets you know you need to pay attention. Whether it's a route to avoid paying parking fees, or a son who actually seems to like some creepy guy following his sister around, readers not only need to laugh when reading a Zack Walker book, they need to pay attention and to think ahead. Just think of yourselves as Sherlock Holmes to Zack's Dr. Watson. Now that I've laughed (and gasped) my way through Bad Guys (because Barclay knows how to write first-rate action scenes that scare the pudding out of us), I have to get my hands on the third book in the series, Lone Wolf. Linwood Barclay's Zack Walker books should not be missed! Oh, I liked the Walker family in Bad Move very much, Cathy. Nice to see that Zack is back. And the plot sounds like a nice balance of zany with 'actually might happen.' That's tough to pull off. Add the wit, too, and it's really appealing. Glad you enjoyed it. Did I even know that Linwood Barclay had written a series? Before his standalones I guess. I'll have to research this because I love his books - at least all the ones I've read. So far I've read one of his standalones and two of his Zack Walkers. I've enjoyed them all. He wrote Zack first but stopped because sales weren't what the publisher had hoped. Oh my gosh, I enjoyed these books so much, a good and an enjoyable read. Love the whole series. I know! I have the next one on its way here, and I'm looking forward to reading it! I loved these early books by Linwood Barclay - SO funny. Unfortunately he has since stopped writing funny and concentrated instead on thrillers of the hard-boiled variety - or so it seems to me. I miss Zach and his family and his paranoia. I like how I enjoy reading about Zack when he's the type of person who would drive me up a tree in real life. In print, I find him hilarious.